Taskmaster returned for a fourth series on Wednesday, and this time around they’ve doubled the number of female participants to TWO!! 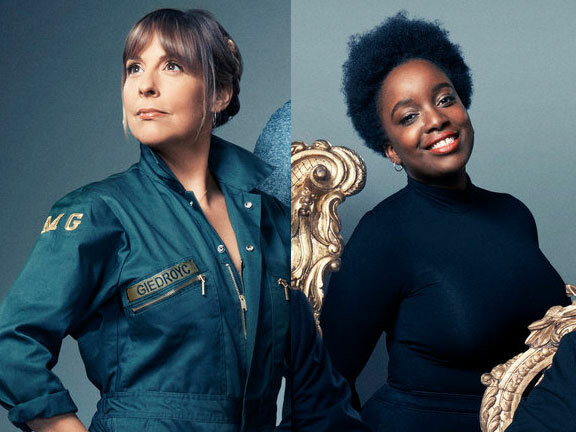 Specifically, actress/presenter Mel Giedroyc and actress/comedian Lolly Adefope. Sadly, they’ve also decided to stick with an unwieldy total of five contestants, meaning that once again the teams will be uneven if/when they’re split into a-pair-and-a-trio for certain challenges… which I still find quite unfair/irritating, even though this is a comedy show, and they’re not really competing for anything of serious value. Tch! Meanwhile, this series is inadvertently (?) bridging the gap between the BBC’s original Great British Bake Off (as represented by Giedroyc), and the upcoming Ch4 reboot, which will be co-presented by Noel Fielding. By a curious coincidence, they’re also the only two contestants to have brought overalls to wear for the challenges, rather than regular clothes (Noel even went to the trouble of personalising his yellow hazmat suit with black skeleton bones, which would have won him extra points for style if I’d been in charge of the scoring). Personally, I’m willing to give the new version of Bake Off a go, out of curiosity… though I’ll most likely record it so I can skip the commercial breaks. I do think it’s sort of hilarious that Ch4 spent so much money on filching the show without checking that the on-camera talent would be part of the deal… rather like buying a house based on a photo, and then discovering that it has no internal walls/floors/fittings. All they really ended up owning was the brand-name and the tent… and, imho, the tent is the stupidest part of the whole format, considering how often it ruins people’s bakes by getting too hot on sunny days. I’d much rather see them based in a proper kitchen, with air-conditioning keeping the room at a consistent temperature… though I guess that would take some of the drama/fun out of it for some viewers…? This entry was posted in Rants about TV and tagged Lolly Adefope, Mel Giedroyc, Taskmaster, The Great British Bake Off. Bookmark the permalink.